Acting Balanced: Spooktacular Book Blog Giveaway Hop Giveaway! 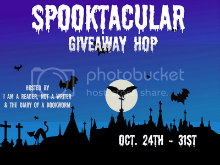 Spooktacular Book Blog Giveaway Hop Giveaway! This giveaway is for one $15 GC to your choice of Barnes and Noble, Amazon.com or the Book Depository and is OPEN WORLDWIDE so that you can pick any book you want!! !